According to getactivetampa.com, Pasco County Sheriff's deputies are giving citations to cyclists riding double pace lines in the San Antonio area. Pasco county sheriff came to the San Ann parking lot this weekend and warned riders to individually stop at stop signs, the web site said. Thank you Steve Swiger for this Off-the-wall bike unit that stands in my office. I thought a fun difference between Portland and Tampa in the big trike world were these two tricycles. 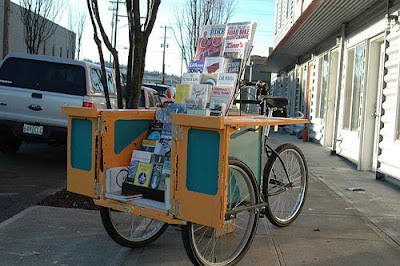 Here's one in Portland that distributes all types of bicycle literature, while the one in Tampa . . .
. . . distributes beer. I saw this trike on Nebraska Avenue while finishing a roundtrip bike ride from Seminole Heights to downtown St. Petersburg and back today. It was brisk out there this afternoon -- temps in the low 50s with cool winds out of the northeast. Maybe he wants to join SWFBUD? I had the chance to write about the Columbia Restaurant for the Nation's Restaurant News, the trade publication that covers the restaurant industry in this country. Richard Gonzmart, the Columbia Restaurant owner, is also a big supporter of bicycling. You probably have seen this scene at many intersections around the Tampa Bay area. People selling bottles of water. I was biking down North Dale Mabry Highway at Van Dyke and saw this. The president drops into town and it's a big deal. It also brought together the anti-Obama Dream Team. This fella was a bit fixated on Nancy Pelosi. The media swarmed to the scene. That snuggy is so versatile. We interrupt daily bicycle coverage with a stop at the famed Taco Bus, which is having a T-shirt design contest. Sad to report. Another bicyclist in Florida is dead. This time, a 12-year-old Lutz boy north of Tampa. ADD: Apparently, the authorities gave out the wrong information and the driver's age is 17 -- not 87, as initially reported. ADD2: Another Hillsborough boy has been killed on a bicycle. If Tampa police do not know Florida bicycle laws and believe bicyclists should bike on sidewalks, no wonder motorists follow that lead and harass bicyclists on the road by yelling at them to get off the road and bike on the sidewalks. I was riding on Cross Creek this morning and an approaching car on a side street slowed as I proceeded across but it kept rolling and did not stop for the stop sign. I was forced to go around the front of the car until the driver saw me. The driver told me she didn't see me because her windows were fogged!!! Then on Hunter's Green I was yelled at to ride on the side walk. I caught the driver at the Bruce B. Down traffic lights and explained I had the right to ride in the road and it was safer. Of course he did not believe me. And then the lady behind rolled down her window and told me to ride on the side walk as well. Nothing like being ganged up on. Pat Kemp worked so hard for so many candidates and for so many issues in the past that Tuesday was supposed to be Pat Kemp's day. She was running for the Democratic bid to represent Florida House District 58 (Seminole Heights, West Tampa, a bit of Town 'n' Country). Because the district is so heavily tilted toward Democrats, the special election next month to fill the unexpired term of Democrat Michael Scionti, who quit to work for the Defense Department, would certainly go to Tuesday's Democratic primary winner. In other words, yesterday's Democratic primary was winner-take-all. I worked as a newspaper reporter for more than 20 years, and I covered elections year after year. That meant I was programmed to stay on the sidelines, neutrally report the story, try and wade through the charges and counter-charges and, in the end, write a bias-free piece. But now that I'm removed from newspaper life, I'm free to publicly express my political leanings. Naturally, I lean toward bicycles. And for the first time, I helped a political campaign out in the open and leaned toward a political candidate who I knew represented the underdog, was as smart as they come in Tally and paid her dues and then some while doing the heavy lifting for other candidates. Pat Kemp was earnest, committed, tough and right on the issues. And she was classy by thanking her supporters and friends last night. By the way, Pat biked, too, and wasn't afraid to let me know that. To show my support, I bicycled a huge trailer showing a Pat Kemp campaign sign and stood at a corner at Central and Hillsborough during a stint yesterday, waving like all those crazy loons you see with political candidate signs on street corners on election day. Pat was there for a while, too. "Vote today," she told drivers. More than 2,500 registered Democrats in District 58 did, and, by night's end, Pat trailed by 58 votes -- 1,211 to 1,153. Pat did not concede and demanded a recount. I was proud to have towed a huge rolling campaign sign beautfully crafted by Pat's artist daughter Caitlin. The truth was the majority of drivers stared coldly at the road and didn't pay attention. But there were plenty of honks, too, to validate the purpose of biking for a candidate. The other two candidates? Janet Cruz-Rifkin (she didn't use her legal name on the ballot; instead, she used Janet Cruz in the Latino-heavy district) deployed a plane in the morning for a short time to carry her banner. And the third candidate, Gil Sanchez, used a truck. Pat? We used a bicycle. That's symbolic of the differences between the three Dems. Janet and Gil did not even live in District 58. You can do that in Florida -- run for the state House of Representatives without living in the district. But if you win, you have to move and live in the district. Janet lives in a fancy waterfront house in South Tampa. Pat lived in Seminole Heights and in the district. Last night, I experienced my first campaign election results gathering as a participant and not as a reporter, joining 60 other Pat supporters at the Front Porch restaurant. Funny, but last night I almost felt sorry for Janet Zink, the St. Pete Times reporter hunched over her laptop at a table along a wall in the bar. I was excited by politics in a way I never felt before when I was a detached reporter. Everyone in the room genuinely loved Pat, chanting her name after Pat thanked her campaign helpers and friends. Pat didn't have to pay $100 yesterday to people she didn't know to hold signs at the polling stations like Janet Cruz did (one such Cruz worker named Julia at the 318/319 precinct polling center at Nebraska and Hillsborough said she loved the artwork of Pat's rolling billboard sign I towed and even asked where Pat was holding her election party). Pat trailed through the night by 100 votes or so. But it was still nerve-wracking when the numbers were announced in the end when Pat had cut into Janet Cruz's lead, reducing the margin to only 58 votes. It's unlikely a recount will yield a different winner. But I can still hope. When I left, I told Pat I'm going to keep the campaign sign on my bicycle trailer because we'll need to break it out for the general election campaign next month. Today I helped the Pat Kemp campaign by cycling around Seminole Heights with the Kemp sign trailer in hopes Democrats in Florida House District 58 will vote for Pat, who is pictured above at Hillsborough and Central avenues by the Starbucks corner. Today is the Democratic primary for the unexpired term of this House seat. 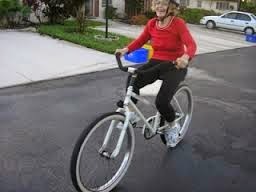 She's an ardent supporter of alternative transportation, including bicycling and I plan to work to get pro-bicycle politicians elected regardless of their political affiliation. The polls close at 7 PM and the results should be tabulated by 9 PM. Pat is having her election results party at the Front Porch on Florida Avenue. This afternoon, there was a funny moment while biking the Pat Kemp bicycle trailer on the Democratic primary trail today in Seminole Heights. At Precinct 318/319 on Hillsborough and Nebraska, I began chatting with Julia, a friendly sign-holder for the Cruz campaign. She said she loved the "Pushing Pedals for Pat Kemp" sign, a lovely piece of artwork fashioned by Pat's daughter, Caitlin. Then she asked, "Where Pat's party tonight? I want to meet her daughter." Julia is getting paid to hold a Cruz sign at the polling place, but apparently was smitten with the Pat Kemp rolling campaign sign. Maybe we'll see Julia at Pat's results party at the Front Porch restaurant on Florida Avenue in Seminole Heights. The Los Angeles police chief has decided to forge a working relationship with local bicyclists. I hope Tampa Police Chief Jane Castor, a bicyclist, follows that lead. A drunk hit-and-run driver, a musician named Carlos Bertonatti, slammed into a south Miami bicyclist on the Rickenbacker Causeway in Key Biscayne in the Miami area, killing the bicyclist who bled to death when the driver fled. A cyclist, who came upon the tragic scene, offered this witness account. From his account: "As I get closer, there is a cyclist on the right hand edge of the break down lane in a pool of blood, bright red arterial blood mixed with what looks like spinal fluid and some brain matter. He is bleeding out of his ears and mouth." As upsetting it is to read this graphic account, I posted it to show the horrific results when drivers do not take care when interacting with bicyclists. Drivers, don't get mad if you see a bicyclist in the road -- slow down, don't honk, and pass with care by offering a clearance of at least three feet. I moved to Tampa six years ago and I quickly realized that Tampa is a southern city that lacks major public and civic amenities when compared to other major cities across the country. To put it another way, Tampa is the Dollar General of cities, offering cheap basics but not much more. For example, every big city has a big downtown park to host major civic gatherings from concerts to festivals. I never did understand that. Tampa relied on a square-ish park called Lykes Gaslight Park, which was good for small events. Today, Tampa took a step to address its downtown green space woes. It officially opened the Curtis Hixon Waterfront Park next to the Tampa Museum of Art. The ribbon is ready to cut. The billboard trailer made an appearance at the park opening to promote Pat Kemp's candicacy for the unexpired term of the Florida House District 58. Here, the famed bicycle billboard leans on the railing along the Hillsborough River. The park looks pretty. But lack vegetation and shades trees. And bike racks. There are just four metal loops bolted into the ground for an entire park. I spoke with Steve Dagnault, the city's public works and utilities director, at the festivities and asked him if the city will have bike lanes on roads leading to the park. The city's utilities/public works chief thought that was pretty funny. Here is one bike parking area with two bike-rack loops at the new park off the riverwalk . . .
. . . and these two off Ashley Street. It's not a ribbon-cutting without the mayor chatting with a youngster. Without bike racks, people leave bikes on the ground. With not enough bike racks, people lock up bikes on railings. With no place to lock bikes on racks, bikes hang out. Memo to Tampa government: people love to bike if you give them a safe place to bike. Tables set up for kids. This morning, Carrollwood Bicycle Emporium employee Chad Luppino was bicycling to volunteer at the Children's Gasparilla Parade Bike Rodeo in Tampa. A "bike rodeo" is a bike event by the local sheriff's office to give free helmets to kids while also teaching them bike-riding skills like pedaling around cones and stopping properly. But for Chad, a funny thing happened on the way to help teach kids about biking at the bike event. A Tampa police officer stopped Chad for bicycling on the street and told Chad to bike on the sidewalk. Welcome to Tampa, FL government -- a government that's just a little behind the rest of the country when it comes to bicycling. Brian Eckman, who owns Carrollwood Bicycle Emporium, tells me Chad's girlfriend called him at the CBE shop and that she was "freaking out" because an officer wanted to arrest Chad for bicycling in the road. Brian tells me Chad advised the police officer a bicyclist has a right to bike in the road. The officer didn't buy it. The officer told Chad to get off the road and bike on the sidewalk. Jim Shirk, a bike rodeo volunteer and bicycle advocate who helps on many bike events, went over and tried to explain to the police officer that a bicyclist has a right to bike on the road. "Jim Shirk tried to explain the law but was told (by the officer) to not get involved," Brian says. 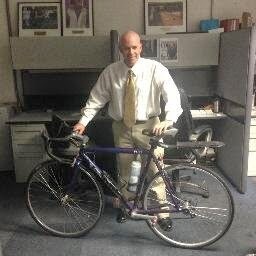 Jim Shirk tells me Chad was singled out by the officer when, in fact, many other people were bicycling on Bayshore Blvd. at the time. Jim says because Chad has a BMX biker look, he was likely singled out by the officer. "At the time people, people were biking all over he place," Jim says. Jim believes Chad was cited by the officer because the officer thought Chad was not respecting him. What is the city of Tampa's problem with bicycling? -- One day I called the city transportation department and asked for a "Share the Road" sign on Rowlett Park Drive, a very narrow road that I take when heading toward the USF campus from Seminole Heights. The city transportation woman said it costs too much to maintain. (I'm not making that up). A transportation director later approved a Share the Road sign request, but then got fired by Mayor Iorio. -- On the same road, HART bus drivers nearly killed me THREE different times when passing me during the past three years because each driver told me he did not know that a motorist has to pass a bicyclist in Florida by a minimum clearance of three feet. -- Also on Rowlett Park Drive, a police officer directing traffic around an accident ordered me off the road and onto the sidewalk. She also did not understand a bicyclist's right to be on the road. -- A Tampa police officer ordered a bicyclist who was cycling across Gandy Bridge off the bridge by telling the bicyclists to bike against traffic back to the Tampa side. To her credit, then Assistant Chief Jane Castor (who is now chief and also a bicyclist) called me to tell me that police would be instructed to not stop bicyclists from crossing the Gandy Bridge. -- The city's public works and transportation VIOLATED its own master plan for bike lanes by not including a bike lane on Tyler and Cass as part of a utility and road project. An email explaining why a bike lane was left out of the project told me bike lanes are "NON-ESSENTIAL." -- A Tampa officer cited a bicyclist for impeding traffic when he was in a traffic lane -- even when he was allowed to be in the lane under law because the width of the lane was too narrow, one of the circumstances under which a bicyclist can legally take the lane. The bicyclist is fighting the ticket and has a court date in a few months. 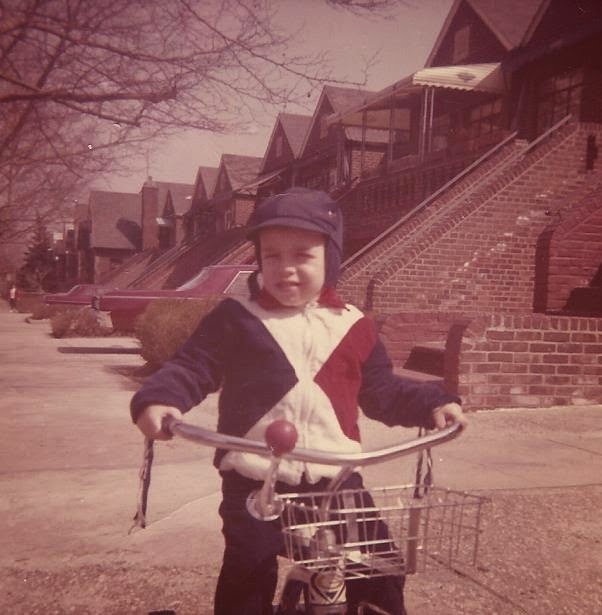 Memo to Pam Iorio and the city of Tampa government: there is a bicycle movement in this country and Tampa's long-held belief that bicyclists should not be on the road is so 1970s. Translation: Tampa, time to come into the 21th century. Other cities across the country -- from Boston to Portland -- have embraced bicycling as a great way to relieve traffic. They have invested in a bicycle infrastructure of bike lanes and wider roads to encourage bicyclists to take to the road. Here in Tampa, a police officer stops a bicyclist on the way to a bike event to help kids bike. What's so dishearterning about this is that a month ago I along with bike laws expert George Martin of the Florida Bicycle Association met with Tampa Assistant Police Chief John Bennett and two other police officers about having George train Tampa police regarding a bicyclist's right to the road. John seemed interested in improving safety for bicyclists. But if Tampa Police do not even understand a bicyclist's right to the road, how are they going to keep us safe on the road? Late this afternoon, I took the billboard trailer with the Pat Kemp election sign and hit the Seminole Heights neighborhoods. Pat is running for the expired seat of House District 58 in tally and is a big bicycle supporter and progressive voice for transportation. I first stopped at Starbucks at Central and Hillsborough Avenues. After a time at Starbucks, it was off to Ella's on Nebraska Avenue -- just south of Hillsborough. Ella's restaurant is famous for its tasty dishes and creative artwork. Owner Melissa supports Pat Kemp as evidenced by the Pat Kemp signs in front of her restaurant. So, she happily allowed me to park the Pat Kemp bike sign trailer in front. The DOT planted a Hillsborough Avenue next signal sign right in front of Ella's. But creative people are resourceful. On the back of the Hillsborough Avenue sign in front of Ella's, people are using it as a canvas for message stickers. I'm not exactly a man of the cloth. But I was asked by Tampa City Councilwoman Linda Saul-Sena to give an invocation at a council meeting this month. I'm an old-fashion Jeffersonian town hall kind of guy, so I believe in democracy and offering words that would resonate to all the citizens of Tampa -- not just those of one particular religion. So here was my invocation that I offered to start Thursday's city council meeting. I'm guessing it's probably the only invocation ever uttered that included the word, "bicycle." May we find inspiration in anything we deem holy so that we who attend this legislative forum can make our city a better place to live and a safer place to walk or ride a bicycle. May we embrace the diversity of our city and respect our differences so that when we congregate here as one in the spirit of the Jeffersonian sense of town hall, we work sacredly and bind our efforts to represent the interests of all Tampa citizens. Let’s have a glorious government meeting in the spirit of making our city a place we can be proud to call home. 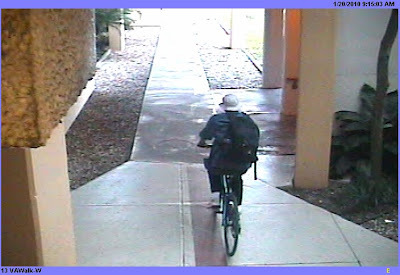 Nick Griffiths, my bicycle friend from Moffitt, says these photos show the bicycle thief who stole his friend Becky's bike. Sgt. Frank Wassenberg of the Medical Center Police Dept. says, "These are the best pictures we have. This man walks over here from Bruce B Downs, then leaves on a bike. Can’t tell if it’s your bike or not. Can you?" Nick believes this is the bike crook. Sgt. 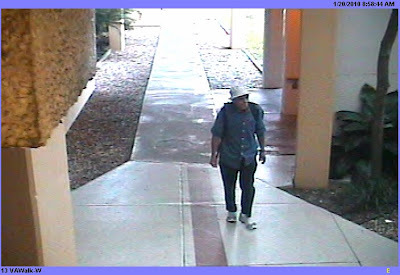 Frank Wassenberg's phone number is 813-974-2675. The Florida Bicycle Association made a tremendous video showing that a bicyclist has a right to take the lane when it's less than 14 feet wide. A lane with a width of less than 14 feet is considered sub-standard because there's not enough room for a car to safely pass a bicyclist who is pedaling at the right side of the road. Check out how a motorist blasts his horn at a bicyclist who is filming a police officer properly taking the lane as part of this video. Obviously, the motorist didn't see that the first bicyclist was a police officer, who stopped to explain the law to the motorist. Keri Caffrey was shooting the video for the FBA Law Enforcement Toolkit. The officer is Bill Edgar. Thanks to Friend of SWFBUD Michael Ploch for sending this along. A Tampa police officer cited a bicyclist for impeding traffic in a lane that I believe is less than 14 feet wide. I hope Brad Mercel, the cited cyclist, uses this video as evidence to show a judge that a bicyclist can take the lane when it's less than 14 feet wide -- a "sub-standard" lane. If you watched the ABC comedy, Modern Family, last night, then you know that stellar bicycle movie, Breaking Away, made a cameo appearance. In a story line where a character (Phil) is teaching his wife and also a daughter how to work a high-tech home theater remote control, the movie on the home theater screen is none other than Breaking Away. The scenes are clear, showing the Cutters winning the Little 500 bike race at the University of Indiana. A comedic touch is the TV show mimicking the Breaking Away celebration scene at the end when Dennis Quaid jumps into the arms of Daniel Stern after the Cutters win (being shown on the home theater screen) by using the same parallel celebration of the daughter hugging the dad when she successfully masters the remote control. But I saw a deeper value to the Breaking Away cameo than just the TV show laughs because it shows that pop culture TV respects bicycling by using the Breaking Away scenes. It's also part of a wider acceptance of bicycling as cool and mainstream in this country as evidenced by TV commercials made by companies such as Kia, Allstate Insurance, and Zyrtec allergy medicine using bicycles as positive components of their ads. I have had three bicycles stolen in the course of my life, including one that was locked up at a college campus. 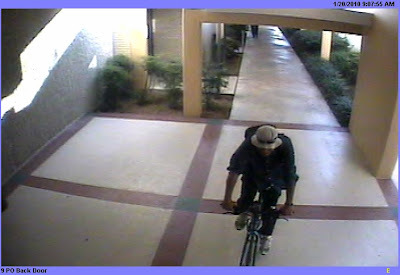 Colleges are a popular place for bike thief rings. My friend Becky had her bike stolen this morning from the stands in front of the American College of Medicine here on the USF campus. She was in fact locked to the same stand as mine. They cut her cable with snips (I use a U lock). Attached is a pic of the style and color of her bike. Could you pass the word around that if a similar bike is seen to let us know? Becky got the serial number from Oliver's. The officer said they usually sell them to Pawn shops. It is a blue Trek 7.3 FX. Michael Ploch, a friend of SWFBUD, sends this cool story about the Boise, Idaho City Council passing an ordinance protecting bicyclists from hostile motorists. It was adopted after three bicyclists were killed. Why do cities pass laws protecting bicyclists AFTER cyclists are killed? 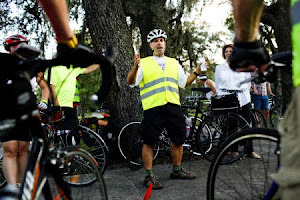 I'm on the road every day with my bicycle in the Tampa Bay region and I see first-hand the reckless and dangerous driving methods of motorists that imperil the lives of cyclists. Why can't cities and counties be pro-active and stage puclic awareness campaigns and pass laws BEFORE bicyclists are struck? Need to read a calming opinion piece about the tensions between bicyclist and motorist on roads? I believe bicycling is an inherently political activity, whether you know it or not. But it's not often Bicycle Stories gets involved in political campaigns. Seminole Heights' own Pat Kemp, running for the unexpired seat in House District 58 in Tally, is getting Bicycle Stories' help because she is an ardent bicyclist and supports bicycle infrastructure. So I enjoyed bicycling the world-famous bicycle billboard trailer with a Pat Kemp campaign sign to her press conference today at West Tampa Library with the "bicycle brigade." Here's part of the bicycle brigade preparing to get ready to roll. Bridget and Pat bike past Hillsborough High School en route to the West Tampa Library. Pat poses next to the world-famous bicycle billboard trailer. Pat's daughter, Caitlin, did a gorgeous job on the sign's artwork, including paintings of the district's architectural highlights such as the West Tampa Library and Sulphur Springs Water Tower. Pat gets interviewed by Kathy Steele of the Tampa Tribune. Janet Zink of the St. Pete Times, where were you? Ya missed a good one! Bridget on the way home from the West Tampa Library. My good Seminole Heights bicycle pal Picot Floyd sends in this cell phone photo of a bike that looks as if it hauled a boat trailer. You're probably aware of the Facebook group that encourages violence against bicyclists and the request to get that group removed. A great blog called sf.streetsblog.org did some nice research and got a response from Facebook regarding its decision to not remove the anti-bicycle group. I wish civility, cooperation and cooler heads would prevail when bicyclists and motorists share roads. But when motorists use inflammatory language to deny a bicyclist's right to use the road, tensions increase. We have seen recent stories in the Orlando Sentinel about conflicts between bicyclists and motorists on country roads; an exchange of emails between the Lakewood neighborhood association president and the St. Pete Bike Club president over cyclists in the road; and I have even had my troubles with HART bus drivers who nearly hit me while I was cycling and told me they did not know there was a 3-foot buffer law that requires all motorists to pass a bicyclist on the road with a minimum clearance of three feet. We even had a Tampa police officer cite a bicyclist for riding his bike in the road. I plan to keep an inventory of cases of local bicyclists who are the victim of hostile or dangerous behavior that you believe imperiled your safety such as this case in San Francisco. If you have a bad experience or dangerous confrontation with a motorist in the Tampa Bay area, please let me know at this blog. The first one came in the form of a comment just last week. 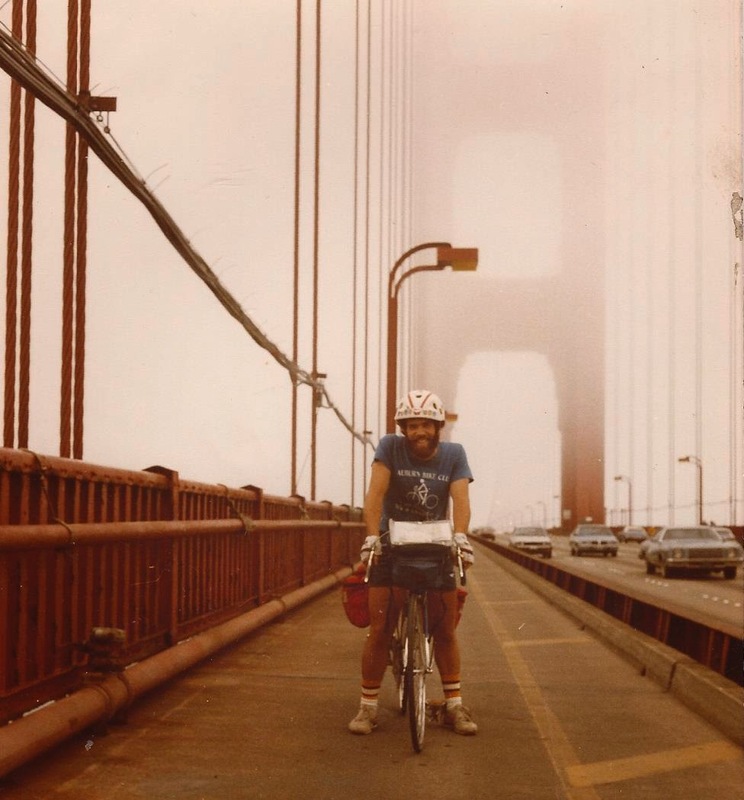 To this day, I have detailed memories of my two solo cross-country bicycle trips -- the first in 1983 and the second in 1989. I mapped my own routes from New York state to the Pacific Coast and let the bike days unfold organically, allowing the weather and people I met and events dictate where I ended up crashing in my sleeping bag that night. I wrote travel stories from the road for newspapers back home in New York during the cross-country treks, and the writing, I discovered, proved to me my companion. 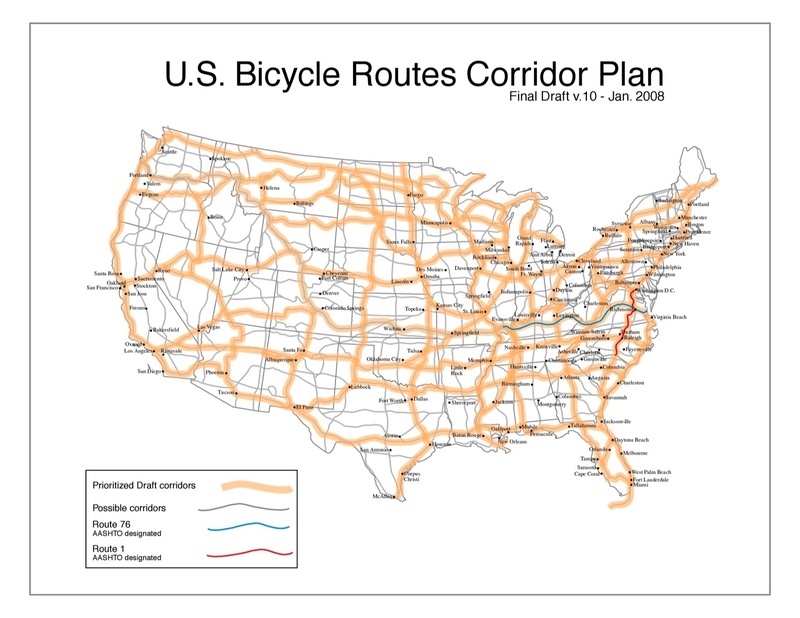 I didn't realize it at the time, but I was doing adventure cycling -- exactly what Jim Sayer was trying to convey tonight at a nice presentation at the Carrollwood Bicycle Emporium bike shop. 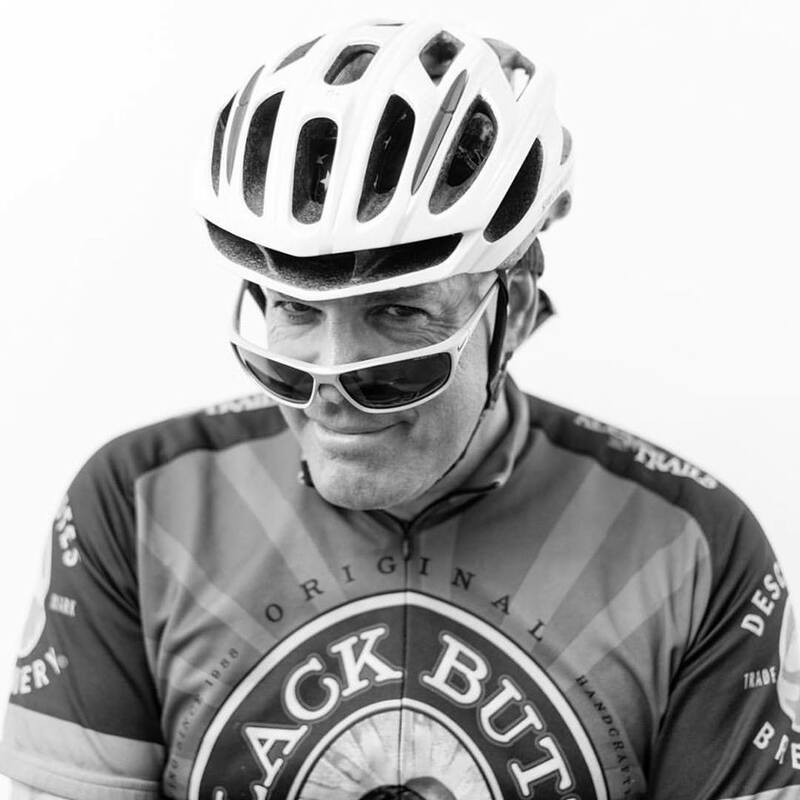 Jim is executive director of the Adventure Cycling Association and he spread the gospel of overnight cycling -- whether it be for one night or a mega-cross country biketrip or multi-continent voyage. Jim pointed out the efforts to have a national bicycle route system and the wonderful benefits of adventure cycling. It was cool hanging with Jim and Brian Eckman, owner of Carrollwood Bicycle Emporium, which hosted the Adventure Cycling presentation. It was a fun night to also see the local bike regulars, which included Jim Shirk, Tina Russo, Bill and Ellen of American Classic wheel manufacturers, Ellen Pierson of the Police Unity Tour and Ed Hillsman from CUTR.